Homemade bone broth (also called stock, without seasoning) helps speed healing and recuperation from illness. Just as the old adage implies, chicken soup really can help cure a cold! Specifically an amino acid in chicken, called cysteine, thins the mucus in the lungs and makes it less sticky in order to expel it more easily. 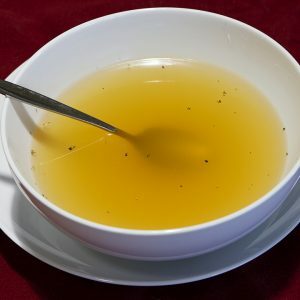 Chicken broth and other bone broths also contain minerals, such as calcium, magnesium, phosphorus, silicon, sulfur and some trace minerals in a form that the body can easily absorb and use. These minerals are necessary for healthy human bone formation and strength. For those who suffer from arthritis, the boiled down form of chondroitin is extracted from cartilage and tendons of the carcass helping to reduce joint pain and inflammation. Both broth is also excellent for ‘healing and sealing’ the gut. According to Dr. Natasha Campbell-McBride, author of Gut and Psychology Syndrome, the gelatin extracted from the bones is a hydrophilic colloid. This simply means it attracts and hold liquids, including digestive juices, thereby protecting and supporting proper digestion. How about a mug of warm broth before bed? Glycine, another amino acid found in bone broth, has a calming effect, which may help you sleep better! *The addition of vinegar helps leech all those valuable minerals from the bones into the stockpot water. The goal is to extract as many minerals as possible out of the bones into the broth water. Place the whole chicken or chicken carcass into the pot. Bring to a boil, and remove any scum that rises to the top. Reduce the heat to the lowest setting and let simmer. If cooking a whole chicken, the meat should start separating from the bone after about 2 hours. Simply remove the chicken from the pot and separate the meat from the bones. Place the carcass back into the pot and continue simmering the bones for another 12-24 hours. NOTE: If cooking bones only, simply let them simmer for about 24 hours. Add the fresh parsley about 10 minutes before finishing the stock, as this will add healthy mineral ions to your broth and a fresh flavour before serving. Remove remaining bones from the broth with a slotted spoon and strain the rest through a strainer to remove any bone fragments.